The Industrial Development Authority* was created in 1968 to promote industrial growth in the County. 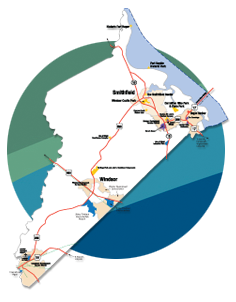 As a support organization for the County’s Department of Economic Development, it may authorize the issuance of tax-exempt industrial bonds to industries locating or expanding their operations in Isle of Wight. Contributions made to the authority are used to promote industrial development and existing business to provide an adequate tax base for government services and to promote employment opportunities for County citizens. * In February 2015, the Industrial Development Authority was renamed Economic Development Authority. Isle of Wight County Economic Development Authority meetings are held the second Tuesday of each month at 4:00 p.m. in the Robert C. Claud, Sr., Board Room on the Isle of Wight County Courthouse Complex on Route 258. For more information, call 757-356-1962.